Italian composer and violinist Giuseppe Tartini (1692-1770) was said to have composed over 400 works during his lifetime. Among them is a piece he named the “Devil’s Trill Sonata.” It was said that Tartini composed this work after hearing it played in a dream. And the performer in the dream was none other than the Devil. 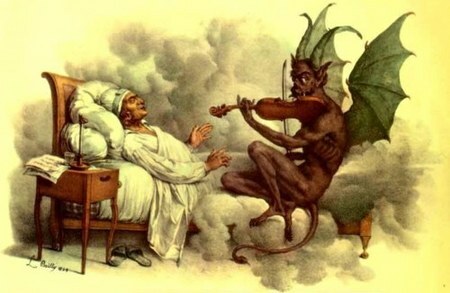 As Tartini’s story was told by his friend, French astronomer Jerome Lalande, the composer dreamed that the Devil came to him and asked to be taught how to play the violin. After giving lessons, when Tartini handed his violin to the Devil to test his skill, the result was the sonata. Tartini received basic training in music while a boy but he did not become interested in the violin until he was in his twenties and was inspired by the playing of Francesco Maria Veracini in 1716. Determined to become a great violinist it was said Tartini moved to Ancona where he locked himself away in a room to practice. He also joined the opera orchestra of the city which forced him to develop his talents. By 1721 Tartini’s skill was good enough that he was appointed Maestro di Cappella at the Basilica di Sant’Antonio in Padua. Other interesting things about Tartini is that he was the first known musician to own and use a violin made by Antonio Stradivari. He also opened a violin school that attracted students from throughout Europe. His home town of Piron has his statue in the town square. The Devil’s Trill Sonata remains Tartini’s most famous composition. Few musicians can successfully perform this work because it requires a number of technically demanding “double stop trills” with the left hand. There is an ancient myth that Tartini had six fingers on his left hand which made it easier for him to perform the work.